OWON MSO8202T is a dual-channel mixed signal oscilloscope with 200 MHz bandwidth, up to 2 GSa/s real-time sample rate, 16-channel Logic Analyzer with 200 MHz bandwidth, and 8" display. 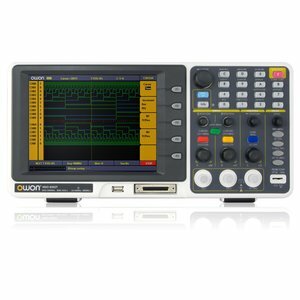 Owon MSO8202T Mixed Logic Analyzer/Oscilloscope – 1 pc. Logic analyzer module – 1 pc. Power cord – 1 pc. USB data cable – 1 pc.